Finally!! Some Good News (but a bit of bad) on the American Obesity Scene!!!! Based on three sources of data the article concludes that fewer calories are finally being eaten in this country, with the best reductions in calorie intake occurring in families with children. Which brings to mind a motivation I have heard from several of my coaching program students, that they wished to be in better health and lose weight for their children in order to be around to take care of them. Great motivation if you ask me. If that one reason alone causes you to try corset waist-training, it’s enough to almost guarantee your success if you choose reasonable goals. The three data sources from which to conclude there is now less calorie consumption in America are: (1) food dairies traced by the government researchers (don’t ask what that is as I don’t know), (2) food bar code info, and (3) food production. The most striking shift the article says, is that soda drinking has dropped 25% since the late 1990s. I remember one former student who before joining our coaching program, drank 10 fully-leaded sodas a day. Amazing that. She was surely on a course to self-destruct. Sadly, without reason, she dropped out of the three-month program just two weeks shy of completion, and stopped returning my emails or phone calls. It represented a huge disappointment to me, but there is nothing to be done if a student refuses to communicate, and a few refuse to do so. The sad problem pointed out in today’s article however, is that we continue to eat a bit of every food group and other than sodas, have not cut back on desserts and refined sugar. You may have noted that that is my latest “big reveal” to myself: I was eating far too many desserts (refined sugar) and thus had added about an extra 200-400 calories to my daily consumption, resulting in a 10-15 lb weight gain and 1″ waistline gain in 1.5 yrs past. When in May I read “I Love Me More Than Sugar” by Barry Friedman, the message clicked!! I DO love me more than sugar…and I love being and feeling svelte and healthy and energetic. And that realization resulted in four weeks of just giving up sweet breakfasts and desserts but not being obsessive about it. I don’t eschew a bit of sugar added to things like packaged Bisquick, and I enjoy a wee bit of organic honey from time to time, and do eat lactose sugars like my low 80-cal. Greek Yogurt with only 7 gms. of sugar. On June 14 I weighed 120.6 lbs, but today I weighed 114.2 lbs – and am determined to keep moving down to my goal of a consistent 112 lbs — but with increased muscle strength, flexibility and balance. I’m achieving those three things from my three-times weekly yoga and aerobic/stretch classes plus walking 1/2 mile there and back for classes. It’s working for me, so my proof is in the non-sugar pudding! There are two other significant, cautionary points made in today’s article. People take about 15 years for any public health message to sink in. Attitudes don’t change over night!! It takes more than half a generation to effect our behavior–so let’s get started earlier and hit the message harder, especially in the schools and early childhood/family education. Thinking and knowing is not equal to acting! Something more is needed to get us to act on what we know. Perhaps it is peer pressure? Perhaps it is just getting inundated with terrifying public health notices about obesity much like the anti-tobacco movement did? Personally I am horrified by commercials showing smokers who have seriously harmed themselves and seem and are, next to death’s door when they record their messages. But it sure gets my attention. Luckily I quit smoking in 1971 and quit drinking in 1988. It took me until 2015 to quit refined sugar, so I wonder: which is the worse addiction? Second, the good news does not extend to the very obese. Weight and waist circumference have all continued rising in recent years. To me this points to three things. The first is that corset waist-training could fairly be promoted to the very obese. It’s fun. It’s fashionable. It’s pretty (when did an obese person last feel truly pretty?). 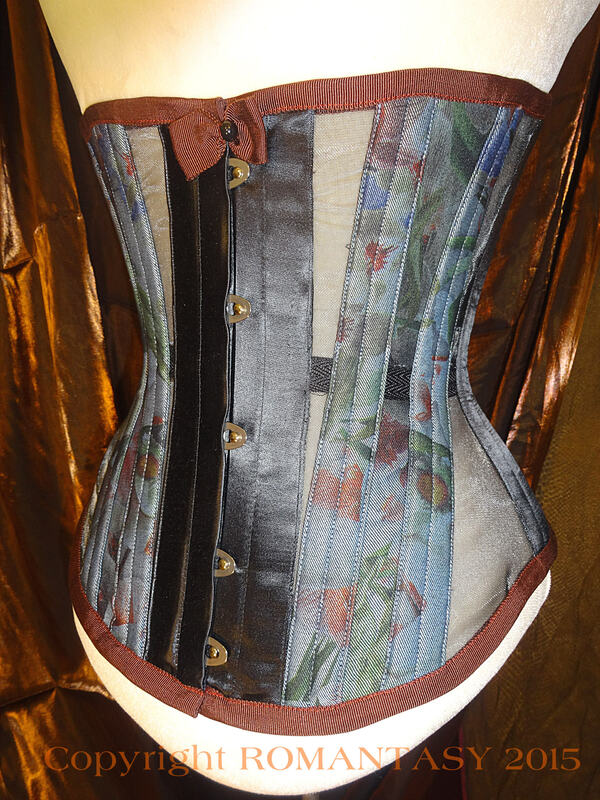 It’s immediate in terms of trimming 3 to 4″ off a waistline the first time you put a corset on, and it immediately improves posture to boot. Then it works it’s magic on a permanent basis as did on Ms. X who in three months of corset waist-training coaching, dropped 50 lbs. from her 325 lb. frame and lost 5″ waistline inches. Note in her picture “before” left and “after” right, that her waistline crease has disappeared, her biceps and neck have slimmed down, and the sides of her derriere have slimmed down. The positive changes are evident. However, we also need to evaluate the emotional component of eating that underlies obesity. If we want to lose weight and get healthier, but we don’t get control of and understand how we got to where we are (a lot of that has to do with internal reasons as well as just more surface food choices, planning, and shopping), then we will likely not succeed. Succeed in what? In reversing the trend up and into worse health. My latest coaching program graduate Dorothy quite brilliantly chose reversing the trend that had brought her unhappiness and poor self image as she had expanded over time despite an active exercise program. You can read about her success in just prior blogs. If we don’t reverse a negative trend, then most likely we will just experience failure in part or in whole, give up again, and yo yo back up and keep going in putting on weight as we age and it gets harder to lose. There is clearly more work to be done in addressing our national and international epidemic of obesity, but we hope with less reliance on surgery and “quick fixes.” This all starts at home in what you and I will do individually to improve our health. It has a lot to do with whether we can and do stick it out in the face of questions, even ridicule, possible jealously expressed by others as we trim up, and “friendly” pushes to give in to temptations and go off track. So, do you love you more than (fill in the blank when it comes to food indulgences)????? Today Dorothy came over to report her final weight and have me measure her for her concluding report, and also to verbally quarterback briefly her three months of coaching in our waist-training program. We also took concluding “after” photos in her corset and without it. Note above how her ribs have smoothed out and the contours of the corset over her tummy have flattend out, not to mention the fact she almost has the corset closed in back (and can wear it for 10 hrs. that way). On a scale of 1 to 10, Dorothy was satisfied with her progress at a level of 7–pretty darned good in my opinion! Her original goal on April 18 was a 20-lb. weight loss. She lost 12.8 lbs. 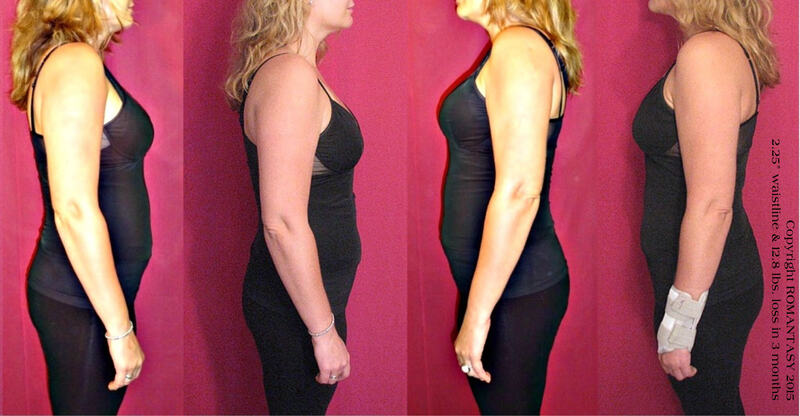 Her waistline reduction goal was 3″ and she lost 2.25″. We both were a little disappointed that she did not reach her exact goals which we felt were reasonable, but both of us noted that weight did not begin to drop off til her ninth week of training. This proves a point I often make regarding many of my clients and students. Some take longer than others; don’t give up but go all the way for at least three months of corset waist-training! The most important success or result of the program we both agreed, was that she had reversed the negative up direction in weight and size she was experiencing the past few years (she is now 40 yrs. old), a direction that had disheartened her in the past. Once she had walked past a shop window, looked in it to see her reflection, and felt that she looked like a dowdy older woman. She was not happy! Yet she had kept thinking that there had to be a magic combination of calories, food, and exercise that would automatically drop pounds off and reshape her figure to that of her 20ties, but she could not find the formula. She continued to eat the same amount, indulge in chocolate, and enjoy nice expensive wines (high sugar content and calories). Just being active in a gym program had not accomplished what she desired. She realizes now that she has to attend to how much she eats, and pursue what works for her including periodic corseting for maintenance. She has to be disciplined enough to stay moving in the right direction down, not up, in order to avoid falling into the obesity trap that is sadly, encircling the globe and is of particular danger to older folks. At my age of 30 years older than Dorothy, I know that I must shave at least 300-500 daily calories off what I could daily consume at age 40, so both of us will have to continue to slow down our intake for the rest of our life — and we can do that! I’ve been blogging about my recent successful strategy of reducing to almost nil, refined sugar from my diet. Dorothy reduced her calorific wine intake and focused on adding more natural fruits and vegetables (she is a vegetarian to begin with). As a result of her training she now believes she is headed in the right direction to improve her overall health and to keep losing slowly and trimming a bit more off her midriff. Both of us agreed we are committed as we age to staying trim and healthy, practicing good posture, and enjoying a good bit of energy for the challenges and pleasures coming in life. To accomplish that she now has the techniques and steps in nutrition, corset wearing, and exercise with her Maintenance Program in place (posted on my prior blog). To celebrate her new direction, one of our graduation presents was a tiny “Hello Kitty” train token Dorothy could attach to her key chain, visually reminding her each day of her desire and goal to keep moving in the right direction! Note particularly her much-improved posture and shrinking tummy that now proceeds vertically to the floor. The small “bum” at the tummy is actually the top of her pants under her cami top. WHAT WAS MOST CHALLENGING ASPECT OF THE PROGRAM? What was most challenging were the long hours, namely 10 to 12 per day at the tightest levels she reached during the last two weeks of her program. By the third month you have shed the squishy fat and are becoming more toned and with muscles closer to the surface of the skin, thus it becomes tougher to lace down just when you are reaching a daily wearing schedule that is at its tightest level, and also the toughest to achieve. It’s almost the reverse of what you might expect. With more practice you would think you could lace down more and more easily, but you cannot. Some aches Dorothy experienced in her corset also seemed to cause the challenge, but the mechanical matter of struggling to close down the corset was certainly an issue for her. When I laced her into her corset to see and measure her progress and pulled as hard as I could, I noted that her X-boned back protector by now was bunching up and adding bulk to her waistline. The bulk was interfering with her reaching her lacing schedule of 27″ over the corset for 12 hours. Like Dorothy her last week of the program, I could only tighten the corset down to 28″ at the waistline and then could pull no more, although 1.5″ remained open in the back of the corset (only 1″ at the top and bottom). Clearly she has a bit more room to go in this training corset and it will last her a few more months then she will need to build back up to the long long hours before she is ready for a tighter corset, or for us to shrink this one for more months and years of wear. Regarding the bulk of a bunched-up boned back protector, you can’t really get a good pull on the waistline nor an accurate waistline measurement of where she had reached. I recommended she go home, remove the protector and continue to wear the corset as she does over a tight microfiber cami but under her scrubs (she’s a vet) as normal for her Maintenance Program (but just 2-3 days per week as she plans). I’m curious to see if she can now lace down to 27″ over the corset as I suspect will be the case. I’m certain with a few more weeks of effort and no back protector inhibiting tightness, Dorothy will get this corset closed top to bottom, removing the full 1.5″-waistline gap noted today. I questioned Dorothy about the major physical and emotional changes or issues she noted. Interestingly, there were no emotional benefits or detriments she discovered during her training and she felt neutral about that matter. She said she still had the same amount of stress as a busy vet and surgeon. Her monthly bloating remained the same, and her general mood remained the same as normal. She mentioned only that on some days while she never reached that “get me outta this thing” moment where she went screaming to the bathroom to remove the corset, she did get a bit frustrated. This was because the corset inhibited her active up and down daily work pattern of lifting animals up to and down from the examination table, carrying them, and bending over doing surgery and other procedures. She had to look at the clock a few days and just bear up 30 more minutes or so to make her day’s planned hours of continuous wear and level of wear. And she had to learn to live with a less flexible torso. However she did all that. She never loosened up her corset despite occasional frustration, nor did she ever deviate from the plan. I congratulate her for that. I can tell now that Dorothy meant what she said at the beginning of the program when we chatted, that she intended to give it her best and a fair try–and she did. What I did note was that she said that in the past she had had trouble with wanting to give herself excuses to avoid doing something a bit challenging, like exercising. She called it “facing herself”. She did find some days like that during corset waist training, but she was above to face herself down, and stick to the program. For that I trust she will feel justly proud of herself and find a good deal of pleasure upon reflection about her program. She also mentioned when questioned, that her sister and several friends noted that she looked slimmer after some weeks in the program. Dorothy definitely noted that after a few weeks her hunger dissipated. She mentioned that one day during training when she would normally have eaten a mid-afternoon snack, she noted she was not that hungry, put on her corset, and went all the way until dinner without snacking. It seemed to surprise her! But this is just the proper strategy if we do have to cut back calories; use the corset as your friend to minimize and then disappear hunger. Dorothy noted that she liked the back support she felt during long hours of surgery, something she had not expected at the start of her program! One item she mentioned in the physical realm, was that at 10 to 12 hrs. of corset wear at the tightest level of 28″, she noted a wee bit of what we both believe to be muscle tenderness at her side back, just above her waistline. It resolved itself upon removing the corset, within about a few minutes to an hour at most. She treated it occasionally with Ibuprofen or topical Arnica cream and both seemed to help. Once it came on, the discomfort lasted as long as she had the corset on, but she did not loosen up the corset nor take it off. She just bore up with no serious ill effects that we can document. I’ve written an extensive recent blog on the possible causes of this sideback muscle ache either just above or just below the waistline. Dorothy, medically trained as mentioned, concurs with me that it is likely due to muscles being restricted or pressed upon and resisting the external pressure of the corset. Since she has an active gym program in place, she likened the feeling during long hours of tight corseting, to an exerted or exhausted muscle and how it feels after vigorous exercise. Overall my impression was that Dorothy found this to be a minor irritation or challenge and one that she could “muscle” through (could not resist the pun!). She also noted that in the third month of training, on the side front and side back just above the waistline, her skin chaffed. It became a bit scaly and red. Removing the corset and rubbing the skin with lotion seemed to help and there was no skin breakdown at all. This did not prevent her from corseting her six days per week on the schedule we had worked out for her, and it went away by the end of her program. She also noted a bit more burping after lunch (but not gas passing in the other direction which some students notice). What was interesting to note was what Dorothy did NOT experience. She had no trouble with urinating and went no more frequently than in pre-training days. Personally I note that I go more frequently when I am continuously corseting or periodically waist training, because the bladder is compressed and I drink more water than normal Dorothy did not have to be urged to drink more water because she already was hydrating sufficiently. So for her, nothing changed in that regard. For the first two weeks she did note some constipation but it resolved itself with no particular changes. Most likely this is because of the gentle early restriction of the corset inhibits the movement of the bowels, but Dorothy maintained as said, a very vigorous gym program working out on machines including I learned, hand weights used during squats and other challenging exercises. In other words, if I’m lacing down 2 inches I don’t immediately go there. I put my corset on at the same size as my normal waist, go for a few minutes, lace down 1/2″, put on my makeup, lace down another 1/2″ and drink some water, and continue to my day’s goal. I just don’t lace down immediately. But for Dorothy this seemed not to be difficult at all. Perhaps it has to do with the amount of fat or muscle surrounding the midriff that makes it tougher or easier to lace faster or slower to one’s desired level. C. Changes in sleep patterns – there were none as Dorothy says she has no trouble there. D. Heartburn or acid reflux – there were none. D. Bruising or marking of skin – other than the bit of skin and temporary red spot and chafing, there were none. E. Tiredness or Energy level – no change. All in all Dorothy’s journey seems to me to have been rather uneventful. She passed thru her waist-training three months with equanimity, aplomb, and commitment. She had stressors to contend with for sure: at one point she had to travel out of state to a vet’s conference and even deliver a paper, surely a stressful event. One week she had to put in 12-hr. days with lots of surgery hours when a vet colleague took a short leave. During it all she pursued with determination the program we worked out and to which she originally committed. In other words, she never used these stressful events as an excuse to deviate or terminate the program. She more than met my standard of complying with 95% of the program as a goal, assuming she will now complete our final written Evaluation Form and get that back to me with further details! I’ll be posting her “after” pictures soon, so please come back. And I’ll be checking in with Dorothy at three months, six months and one year to see if her direction and progress down continues, and if she is complying with her Maintenance Program strategy, to see if it is realistic and to ensure that her commitment endures. After all, she has just now completed stage one: stage two is the rest of her life! Our current waist-training coaching program student has added one week to her three-month program, so we’ll be taking her concluding photos end of this week. I can’t wait! Pictured here are her beginning photos taken on April 18. Note the back of her corset is open about five inches (and she was at this time laced down three inches already). Her goal was to close it down completely and wear it for 1o to 12 hrs. rather comfortably. In the meantime I think her proposed Maintenance Plan could be of help to others so I am posting it below. Her training buddy suggested that she add one week per month for cutting back a bit on calories, to keep her weight going down until she reaches her weight goal. Originally she had wanted to lose 20 lbs, but lost 11.5 so far. We’ll have her final weigh-in this weekend. I think this idea is sound. She is now within 1″ of completely closing her training corset down to a 27″ (over corset) measurement! In this extra week of training, she is attempting to go beyond 27.5″ for 4 hrs and reach down to 27″ for at least some time. It will be amazing to see this corset closed in back! Overall her Plan seems simple and thus, do-able to me. I hope it is helpful to those of you who wonder about how to keep tiyr new figure over time and how to make waist training truly “permanent”! Weekdays and Weekends: at least 7 hours of sleep, ideally 8. I have not been able to fully close the corset. I will continue to gradually tighten the corset during my maintenance routine until comfortably fully closed. Weigh-in: daily ideally but at least weekly. I think I will stick with Saturday mornings. Stick with oatmeal or high fiber/high protein cereal for breakfast. Alcohol: 1 glass two to three times weekly. No more than that. Three times weekly classes at gym: Spinning, Body Pump, Zumba. Try some new classes.